Giannis Antetokounmpo (Greek: Γιάννης Αντετοκούνμπο, IPA: [ˈʝanis adetoˈkumbo]; born December 6, 1994) is a Greek professional basketball player of Nigerian descent, who is playing for the Milwaukee Bucks of the National Basketball Association (NBA). 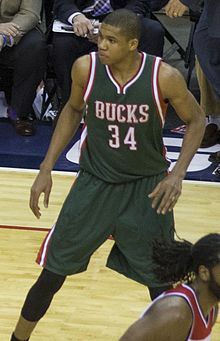 Although nearly 7 feet tall, Antetokounmpo possesses the athleticism and ball-handling skills of a guard, giving rise to his nickname the "Greek Freak". During the 2015–16 season, he became the Bucks' primary playmaker, and in 2016–17, led the Bucks in all five major statistical categories and became the first player in NBA history to finish a regular season in the top 20 in total points, rebounds, assists, steals, and blocks. He received the Most Improved Player award in 2017. He has received three All-Star selections, and led the Eastern-Conference in voting in 2019. Antetokounmpo was born in Athens, Greece on December 6, 1994, the son of immigrants from Nigeria. Three years earlier, his parents had moved from Lagos, leaving behind their firstborn son, Francis, with his grandparents. Even though Antetokounmpo and three of his four brothers were born in Greece, they did not automatically qualify to receive full Greek citizenship. For the first 18 years of his life, Antetokounmpo had no papers from Nigeria or Greece. Antetokounmpo grew up in the Athens neighborhood of Sepolia. The New York Times reported: "Like many other immigrants to Greece, his parents struggled to find work. Antetokounmpo and his older brother, Thanasis, helped out by hawking items such as watches, bags and sunglasses." In 2007, Antetokounmpo started playing basketball, and by 2009, he was playing competitively for the youth squad of Filathlitikos. In 2011, he joined the senior men's team of Filathlitikos, and played with them in Greece's third-tier level semi-pro league, the Greek 3rd Division, during the 2011–12 season. Antetokounmpo spent the 2011–12 season with the senior squad of Filathlitikos, in Greece's third-tier level semi-pro basketball league, the Greek 3rd Division. He then began his professional level career with Filathlitikos, in Greece's second-tier level basketball league, the Greek A2 League, during the 2012–13 season. In December 2012, just days after turning 18, Antetokounmpo signed a four-year deal with Spanish club CAI Zaragoza, reportedly including NBA buyouts after each season. A number of other major European clubs had been interested in adding him as well, including Barcelona and Efes, among others. With the contract starting with the 2013–14 season, he decided to stay with the Filathlitikos for the remainder of the 2012–13 season. During the 2012–13 Greek A2 League season, Antetokounmpo shot 46.4% from the field (62.1% on two-point field goals), 31.3% from three-point range, and 72.0% from the free throw line, while averaging 22.5 minutes per game. Over 26 games, he averaged 9.5 points, 5.0 rebounds, 1.4 assists, and 1.0 blocks per game. He was also selected by the coaches as a special participant in the 2013 Greek League All-Star Game. Even though he was not actually selected as an all-star, the coaches let him play in the game as a treat for the fans. On April 28, 2013, Antetokounmpo officially made himself eligible for the 2013 NBA draft. He fulfilled his draft projections as a first-round pick by being selected 15th overall by the Milwaukee Bucks. On July 30, 2013, he signed his rookie scale contract with the Bucks. Antetokounmpo averaged 6.8 points, 4.4 rebounds, 1.9 assists, 0.8 steals, and 0.8 blocks in 77 appearances during his rookie season. He scored in double figures 23 times and grabbed 10+ rebounds twice, with both efforts resulting in double-doubles. He finished the season with 61 total blocks, which led all NBA rookies and was the seventh-most by a Bucks rookie in franchise history. He was selected to participate in the Rising Stars Challenge at NBA All-Star Weekend in New Orleans, where he tallied nine points, two rebounds and two assists in 17 minutes. At the season's end, he was named to the 2013–14 NBA All-Rookie second team. On October 16, 2014, the Bucks exercised their third-year team option on Antetokounmpo's rookie scale contract, extending the contract through the 2015–16 season. On February 6, 2015, he recorded a then career-high 27 points and 15 rebounds in a loss to the Houston Rockets. Three days later, he was named the Eastern Conference Player of the Week for games played February 2–8, earning player of the week honors for the first time in his career. He later competed in the 2015 NBA Slam Dunk Contest at NBA All-Star Weekend in New York. On March 9, he scored a then career-high 29 points on 11-of-16 shooting in a loss to the New Orleans Pelicans. The Bucks finished the regular season with a 41–41 record, good for sixth in the Eastern Conference. He missed just one game during the 2014–15 season, averaging 12.7 points and 6.7 rebounds in 81 games. In the Bucks' first round playoff match-up with the Chicago Bulls, they were defeated 4 games to 2. On August 1, 2015, Antetokounmpo played for Team Africa in the 2015 NBA Africa exhibition game, representing Nigeria due to his parents being born there. On October 26, 2015, the Bucks exercised their fourth-year team option on Antetokounmpo's rookie scale contract, extending the contract through the 2016–17 season. Antetokounmpo improved his scoring to begin the 2015–16 season, averaging 16 points per game over the first 20 games. He also had a high two-point field goal percentage, hovering around 53% from inside the three-point line. On November 19, he scored a then career-high 33 points in a loss to the Cleveland Cavaliers. On December 12, he recorded a near triple-double with 11 points, 12 rebounds and 8 assists, helping the Bucks snap the Golden State Warriors' unbeaten start to the season with a 108–95 win. On January 15, 2016, he recorded 28 points and a career-high 16 rebounds in a 108–101 overtime win over the Atlanta Hawks. On February 22, 2016, Antetokounmpo recorded his first career triple-double with 27 points, 12 rebounds and 10 assists in a 108–101 win over the Los Angeles Lakers. At 21 years old, he became the youngest Buck to record a triple-double. On March 13, he recorded his fourth triple-double in 11 games with 28 points, 11 rebounds and a career-high 14 assists in a 109–100 win over the Brooklyn Nets, becoming the first Bucks player with four triple-doubles in a season. On April 1, he recorded his fifth triple-double of the season with 18 points, 11 rebounds and 11 assists in a 113–110 win over the Orlando Magic. Two days later, he scored a career-high 34 points in a 102–98 loss to the Chicago Bulls. On September 19, 2016, Antetokounmpo agreed to a four-year, $100 million contract extension with the Bucks. In the Bucks' season opener on October 26, Antetokounmpo scored a game-high 31 points in a 107–96 loss to the Charlotte Hornets. On November 21, he recorded his sixth career triple-double with 21 points, 10 rebounds, 10 assists, five steals, and three blocks in a 93–89 win over the Orlando Magic. On November 29, he tied a career high with 34 points and added 12 rebounds, five assists, five steals and two blocks in a 118–101 win over the Cleveland Cavaliers. On December 5, he was named Eastern Conference Player of the Week for games played Monday, November 28 through Sunday, December 4. Antetokounmpo helped the Bucks to a 3–0 week, averaging 24.3 points (fourth in the East), 10.0 rebounds (tied for fifth in the East), 6.3 assists and a league-leading 3.67 steals. On December 7, he recorded his second triple-double of the season with 15 points, 12 rebounds and 11 assists in a 115–107 win over the Portland Trail Blazers. It was his seventh career triple-double; Kareem Abdul-Jabbar holds the franchise record with eight. On December 23, he had a career-high 39 points, eight rebounds and six assists in a 123–96 win over the Washington Wizards. On December 31, he recorded 35 points, nine rebounds, seven assists and a career-high seven blocks in a 116–96 win over the Chicago Bulls. On January 4, 2017, he recorded 27 points and 13 rebounds and made a turnaround jumper at the buzzer to give the Bucks a 105–104 victory over the New York Knicks. With 25 points against the Knicks on January 6, Antetokounmpo had at least 20 points in his 14th consecutive game, matching the longest streak by a Bucks player since Michael Redd in 2006. On January 19, Antetokounmpo was named a starter on the Eastern Conference All-Star team for the 2017 NBA All-Star Game. On February 10, 2017, Antetokounmpo set a new career high with 41 points in a 122–114 loss to the Los Angeles Lakers. On February 19, 2017, he became the Bucks' first All-Star since Michael Redd in 2004, and the first starter since Sidney Moncrief in 1986. At 22 years and 74 days old, he became the youngest player in franchise history to start in an All-Star Game. He also became the first Greek NBA All-Star. In the game, he led the East with 30 points in a 192–182 loss to the West. On April 3, 2017, he was named Eastern Conference Player of the Month for games played in March. The award marked the first of Antetokounmpo's career and the first for a Buck since Michael Redd won the award in January 2004. Antetokounmpo joined Redd, Terry Cummings (January 1985) and Sidney Moncrief (December 1981) as the only four Bucks players to be named Eastern Conference Player of the Month. 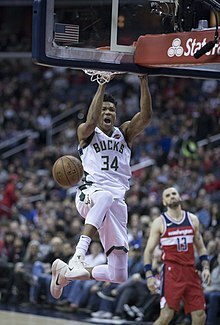 Antetokounmpo helped the Bucks finish an Eastern Conference-best 14–4 in March, the franchise's first calendar month with at least 14 victories since going 16–2 in February 1971. He averaged 22.4 points (ninth in the East), 8.4 rebounds (10th in the East), 4.8 assists, 1.78 blocked shots (fourth in the East) and 1.33 steals in 18 games during the month. On April 10, he recorded his third triple-double of the season with 10 points, 11 rebounds and 10 assists in an 89–79 win over Charlotte, tying Kareem Abdul-Jabbar's career Bucks record of eight. Antetokounmpo led the Bucks in every one of the five major statistical categories (points, rebounds, assists, steals and blocks) in the 2016–17 regular season, becoming only the fifth NBA player to do so after Dave Cowens, Scottie Pippen, Kevin Garnett and LeBron James. He also became the first player in NBA history to finish in the top 20 in the league in each of the five major categories in a regular season. As a result of his efforts, Antetokounmpo was named to the All-NBA Second Team, earning his first All-NBA honor. He was also named the recipient of the NBA Most Improved Player Award for the 2016–17 season, becoming the first player in Bucks history to be named Most Improved Player. On April 15, 2017, Antetokounmpo scored a playoff career-high 28 points in a 97–83 win over the Toronto Raptors in Game 1 of their first-round playoff series. Playing his second career playoff series, Antetokounmpo made 13 of 18 shots, and added eight rebounds and three assists. In Game 5 of the series on April 24, Antetokounmpo set a new playoff career high with 30 points, but could not lead the Bucks to a win as they lost 118–93 to go down 3–2 in the series. The Bucks went on to lose Game 6 three days later despite a 34-point effort from Antetokounmpo, as they bowed out of the playoffs with a 4–2 defeat. Antetokounmpo dunking against the Washington Wizards in 2018. In the Bucks' season opener on October 18, 2017, Antetokounmpo had 37 points and 13 rebounds in a 108–100 win over the Boston Celtics. Three days later, he scored a career-high 44 points in a 113–110 win over the Portland Trail Blazers. He scored 17 points in the fourth quarter, including a dunk that put Milwaukee ahead 111–110 with 11 seconds to go. He was subsequently named the Eastern Conference Player of the Week for the first week of the 2017–18 season. In the Bucks' fourth game of the season on October 23, Antetokounmpo had 32 points and 14 rebounds in a 103–94 win over the Charlotte Hornets, thus registering at least 30 points in each of his first four games. His 147 points through the first four games are the most in team history—Kareem Abdul-Jabbar had 146 in 1970–71. Coming into the sixth game of the season, he had 175 points, 53 rebounds and 28 assists, the best start by a player in NBA history through his first five games. On November 18, he grabbed a career-high 17 rebounds to go along with 24 points in a 111–79 loss to the Dallas Mavericks. On December 4, he scored 40 points in a 111–100 loss to the Celtics. It was his third 40-point game of the season. On January 6, 2018, he recorded 34 points, 12 rebounds and seven assists in a 110–103 win over the Washington Wizards. He had at least 20 points and five rebounds in his 27th consecutive game, marking the longest such NBA streak since Shaquille O'Neal matched it during the 2000–01 season. On January 15, 2018, he recorded 27 points and a career-high 20 rebounds in a 104–95 win over the Wizards, becoming the second-youngest Buck to record a 20-20 game behind Andrew Bogut. Three days later, he was named a starter for the 2018 NBA All-Star Game, becoming the first Buck since Marques Johnson (1979–80) to be named a starter in two straight All-Star Games. On January 26, 2018, he had 41 points and 13 rebounds to help the Bucks beat the Brooklyn Nets 116–91. On February 15, 2018, he recorded his first triple-double of the season with 36 points, 11 rebounds and 13 assists in a 134–123 loss to the Denver Nuggets. It was his ninth career triple-double, passing Kareem Abdul-Jabbar for most in Bucks history. In Game 1 of the Bucks' first-round playoff series against the Celtics, Antetokounmpo recorded 35 points, 13 rebounds and seven assists in a 113–107 overtime loss. In Game 6, Antetokounmpo had 31 points and 14 rebounds, as the Bucks pulled away late to beat the Celtics 97–86 to force Game 7. The Bucks were eliminated from the playoffs with a 112–96 loss in Game 7, despite Antetokounmpo's 22 points and nine rebounds. On October 24, 2018, Antetokounmpo had 32 points, 18 rebounds and 10 assists in a 123–108 win over the Philadelphia 76ers, helping the Bucks improve to 4–0 for the first time since the 2001–02 season. It was his fourth straight 25-point, 15-rebound performance to start the season, becoming the first player since Wilt Chamberlain (in 1964–65 with the Philadelphia 76ers) to accomplish the feat. He was subsequently named Eastern Conference Player of the Week for games played from October 22–28. On November 4, he had his second triple-double of the season with 26 points, 15 rebounds and 11 assists in a 144–109 win over the Sacramento Kings. In four games between November 19–25, he scored at least 29 points in each contest, including scoring a then season-high 35 points on November 23 against the Phoenix Suns. He was subsequently named Eastern Conference Player of the Week for that week. He was named Eastern Conference Player of the Month for October and November. It marked the second Player of the Month honor of Antetokounmpo's career (his first came in March during the 2016–17 season) and became the first player in Bucks history to win Player of Month multiple times. On December 14, he matched his career high with 44 points in a 114–102 win over the Cleveland Cavaliers. His third Player of the Week honor came for games played from December 17–23. On December 29, he had his third triple-double of the season with 31 points, 10 rebounds and 10 assists in a 129–115 win over the Brooklyn Nets. He was subsequently named Eastern Conference Player of the Month for December. On January 5, he had 43 points and 18 rebounds in a 123–116 loss to the Toronto Raptors. On January 9, he scored 27 points and grabbed a season-high 21 rebounds in a 116–109 win over the Houston Rockets. On January 15, he had his fourth triple-double of the season with 12 points, 10 rebounds and 10 assists in a 124–86 win over the Miami Heat. On February 4, he was named Player of the Week for the sixth time. On February 6, he scored 43 points in a 148–129 win over the Washington Wizards. On February 13, he recorded his fifth triple-double of the season with 33 points, 19 rebounds and 11 assists in a 106–97 win over the Indiana Pacers. It was his 13th game with at least 25 points, 15 rebounds and five assists, breaking a tie with Shaquille O'Neal for the most in a single-season since 1976–77. Antetokounmpo represented Greece for the first time in July 2013 with the Greek Under-20 national team at the 2013 FIBA Europe Under-20 Championship. He helped Greece to an 8–2 record and a fifth place overall finish, while averaging 8.0 points, 7.6 rebounds, and 2.2 assists across the 10 games. He finished the tournament ranked second in defensive rebounds (7.0) and seventh in blocked shots (1.4). In 2014, Antetokounmpo played for the senior men's Greek national basketball team for the first time, helping Greece finish ninth overall in the 2014 FIBA Basketball World Cup with a 5–1 record. He averaged 6.3 points and 4.3 rebounds across the six games, while shooting 45.8% from the field. Antetokounmpo again joined the Greek national team for EuroBasket 2015. Greece's roster consisted of many experienced players, most of them previously crowned European champions with their clubs, like Vassilis Spanoulis, Ioannis Bourousis and Nikos Zisis, and Greece was a favorite for a medal, after showing great form in friendly games. At EuroBasket 2015, Greece was unbeaten in the group stages, and reached the quarter-finals, where a tight game ended in favor of the eventual champions, Spain. Antetokounmpo finished the tournament with three double-doubles, and a career-high 17 rebounds against Spain, leading his team in rebounds for the tournament. In eight games, he averaged 9.8 points, 6.9 rebounds and 1.1 assists per game. Antetokounmpo also played with Greece at the 2016 Turin FIBA World Olympic Qualifying Tournament, where he averaged 15.3 points, 5.7 rebounds, 2.0 assists, 0.7 steals, and 2.0 blocks per game in 3 games played. Greece failed to qualify for the 2016 Summer Olympics, after being eliminated by Croatia, by a score of 66–61. Through the year 2017, Antetokounmpo has played with the senior men's Greek national team in 38 caps (games). He has scored a total of 372 points, for a scoring average of 9.8 points per game. Giannis and Thanasis playing basketball at a local court in Sepolia, Athens. He officially gained Greek citizenship on May 9, 2013, with the official romanization of his name being Giannis Antetokounmpo. His nickname is the "Greek Freak". Antetokounmpo's father, Charles, was a former Nigerian association football player, while his mother, Veronica, is a former high jumper. Charles died in September 2017, at age 54. Veronica gave each of her five sons both Greek and Nigerian names, choosing the Nigerian Ougko (/ˈuːɡoʊ/ OO-goh) for Giannis. Antetokounmpo has two older brothers, Francis (Greek name Andreas) and Thanasis, as well as two younger brothers, Kostas and Alexis. He and Thanasis were teammates in Filathlitikos, with Kostas later joining the squad in the 2013–14 season. His oldest brother, Francis, has played football professionally in Nigeria, and both basketball and football professionally in Greece. The entire Antetokounmpo family except for Francis and Thanasis moved from Athens to Milwaukee in early 2014. In July 2016, Giannis and Thanasis began their mandatory military service in Greece. The two brothers served a reduced three-month military service, as prescribed for Greek citizens who are permanent overseas residents. Thanasis made his NBA debut with the New York Knicks after being drafted by the organization with the 51st overall pick in the 2014 NBA draft. Antetokounmpo's younger brother, Kostas, played college basketball for Dayton before being selected with the last pick in the 2018 NBA draft, while his other youngest brother, Alexis, plays high school basketball in the US. ↑ His official surname (Αντετοκούνμπο) is a Greek transcription of his parents' Yoruba language name Adetokunbo; in Greek, ‹ντ› is used for /d/, ‹ου› for /u/, and ‹μπ› for /b/. This is usually transliterated letter-for-letter back into the Latin alphabet as Antetokounmpo. 1 2 "Giannis Antetokounmpo". 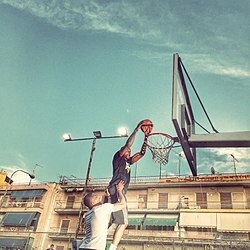 FIBAEurope.com. Retrieved April 4, 2016. 1 2 3 4 Hein, David (March 16, 2013). "Adetokoubo's whirlwind saga just starting". FIBA.com. Retrieved January 23, 2015. 1 2 3 Hein, David (July 13, 2013). "Greek-Nigerian prodigy makes NBA dream come true". FIBA.com. Retrieved January 24, 2015. ↑ Golliver, Ben; Sharp, Andrew (October 22, 2017). "The Greek Freak has Arrived". Sports Illustrated. Retrieved December 12, 2017. ↑ Gregory, Sean (October 17, 2017). "Greek Freak Giannis Antetokounmpo On Growing Up Undocumented, Taking on LeBron and Gunning for MVP". Time. Retrieved December 12, 2017. ↑ Aschburner, Steve (March 8, 2016). "'Point forward' more than a novelty for Antetokounmpo". NBA.com. Retrieved April 4, 2016. ↑ "Milwaukee Bucks superstar Giannis Antetokounmpo finishes breakout season in league of his own". NBA.com. April 12, 2017. Retrieved April 13, 2017. 1 2 "NBA Rookie Wants To Bring Hope To Greece, And To Milwaukee". NPR.com. September 26, 2013. Retrieved April 9, 2016. 1 2 Triantafyllos, Stefanos (July 8, 2013). "Heated Debate Around Antetokounmpo's Home Reflects Rift in Birthplace of Democracy". NBA.com. Retrieved April 4, 2016. ↑ Maguire, Ken (June 26, 2013). "A Hunger for a Better Life May Lead to the N.B.A." NYTimes.com. Retrieved December 31, 2015. 1 2 Filathlitikos AO 2011-12 Roster. ↑ "Basket CAI Zaragoza se hace con los derechos de Giannis Adetocunbo". ACB.com (in Spanish). December 17, 2012. Retrieved April 4, 2016. ↑ "Giannis Antetokoubo profile". FIBA.com. Retrieved December 31, 2015. ↑ "Όλα τα αστέρια στο All Star Game". Sports24.gr (in Greek). March 6, 2013. Retrieved December 31, 2015. ↑ @DraftExpress (April 28, 2013). "Giannis Adetokunbo (@GAdetokunbo) has officially made himself eligible for the 2013 NBA Draft, his agent @DimitropulosFCM tells us" (Tweet) – via Twitter. ↑ "Bucks Sign First Round Pick Giannis Antetokounmpo". NBA.com. July 30, 2013. Retrieved April 4, 2016. ↑ "Bucks sign Neal, Antetokounmpo". NBA.com. July 30, 2013. Retrieved February 8, 2015. ↑ Gruman, Andrew (May 22, 2014). "Bucks' Antetokounmpo named to NBA's All-Rookie second team". FoxSports.com. Retrieved December 31, 2015. ↑ "Bucks Exercise Rookie Scale Contract Options on Antetokounmpo and Henson". NBA.com. October 16, 2014. Retrieved February 8, 2015. ↑ "Houston Rockets hit 15 3-pointers to beat Bucks 117-111". NBA.com. February 6, 2015. Retrieved February 8, 2015. ↑ "Giannis Named Eastern Conference Player of the Week for Games Played Feb. 2-8". NBA.com. February 9, 2015. Retrieved February 10, 2015. ↑ "Davis pours in 43, Pelicans beat Bucks 114-103". NBA.com. March 9, 2015. Retrieved March 9, 2015. ↑ "NBA stars, legends shine as Team World rallies to beat Team Africa". ESPN. August 1, 2015. Retrieved December 31, 2015. ↑ "Bucks Exercise Contract Options on Antetokounmpo, Carter-Williams, Ennis and Parker". NBA.com. October 26, 2015. Retrieved December 31, 2015. ↑ "Giannis Antetokounmpo 2015-16 Game Log". Basketball-Reference.com. Retrieved December 31, 2015. ↑ "James, Love lead Cavaliers past Bucks, 115-100". NBA.com. November 19, 2015. Retrieved December 31, 2015. ↑ "It's over: Bucks hand Warriors 1st loss, win 108-95". NBA.com. December 12, 2015. Retrieved December 31, 2015. ↑ "Antetokounmpo scores 28 as Bucks beat Hawks in overtime". NBA.com. January 15, 2016. Retrieved January 16, 2016. ↑ "Bucks beat Lakers 108-101 in Kobe's final game in Milwaukee". NBA.com. February 22, 2016. Retrieved February 22, 2016. ↑ Devine, Dan (February 22, 2016). "Giannis explodes for first career triple-double, Bucks beat Lakers". Yahoo.com. Retrieved February 23, 2016. ↑ "Antetokounmpo's fourth triple-double in 11 games leads Bucks". NBA.com. March 13, 2016. Retrieved March 13, 2016. ↑ "Parker's driving layup carries Bucks past Magic 113-110". NBA.com. April 1, 2016. Retrieved April 2, 2016. ↑ "Jimmy Butler scores 25 points, Bulls hold off Bucks 102-98". NBA.com. April 3, 2016. Retrieved April 4, 2016. ↑ Wojnarowski, Adrian (September 19, 2016). "Sources: Giannis Antetokounmpo agrees to $100M extension". Yahoo.com. Retrieved September 19, 2016. ↑ "Antetokounmpo gets triple-double, Bucks beat Magic 93-89". ESPN.com. November 21, 2016. Retrieved November 22, 2016. ↑ "Antetokounmpo ties career scoring high, Bucks rout Cavs". ESPN.com. November 29, 2016. Retrieved November 30, 2016. ↑ "Giannis Antetokounmpo, Russell Westbrook named Players of the Week". NBA.com. December 5, 2016. Retrieved December 5, 2016. ↑ "Antetokounmpo gets triple-double, Bucks beat Blazers 115-107". ESPN.com. December 7, 2016. Retrieved December 8, 2016. ↑ "Antetokounmpo scores 39, Bucks beat Wizards 123-96". ESPN.com. December 23, 2016. Retrieved December 24, 2016. ↑ "Antetokounmpo scores 35 as Bucks beat Bulls 116-96". ESPN.com. December 31, 2016. Retrieved December 31, 2016. ↑ "Antetokounmpo's jumper at buzzer gives Bucks win over Knicks". ESPN.com. January 4, 2017. Retrieved January 6, 2017. ↑ "Knicks rally from 18 down, beat Bucks 116-111 to snap skid". ESPN.com. January 6, 2017. Retrieved January 7, 2017. ↑ "Curry, Durant and four first-time starters highlight starting lineups for NBA All-Star 2017". NBA.com. January 19, 2017. Retrieved January 23, 2017. ↑ "Lakers survive late Bucks rally to win 122-114". ESPN.com. February 10, 2017. Retrieved February 11, 2017. ↑ "GIANNIS ANTETOKOUNMPO NAMED EASTERN CONFERENCE STARTER FOR 2017 NBA ALL-STAR GAME". NBA.com. January 19, 2017. Retrieved January 23, 2017. ↑ "'Greek Freak' Giannis Antetokounmpo voted NBA All-Star Game starter". ekathimerini.com. January 20, 2017. Retrieved January 23, 2017. ↑ "East vs West". ESPN.com. February 19, 2017. Retrieved December 4, 2018. ↑ "GIANNIS ANTETOKOUNMPO NAMED KIA NBA EASTERN CONFERENCE PLAYER OF THE MONTH". NBA.com. April 3, 2017. Retrieved April 4, 2017. ↑ "Giannis Antetokounmpo, Damian Lillard named Kia NBA Players of the Month". NBA.com. April 3, 2017. Retrieved April 4, 2017. ↑ "Bucks brush past Hornets for 89-79 win". ESPN.com. April 10, 2017. Retrieved April 10, 2017. ↑ Manrique, Bruno (April 9, 2017). "Giannis Antetokounmpo becomes 5th player in NBA history to lead team in all 5 major stat categories". ClutchPoints.com. Retrieved April 12, 2017. ↑ Cato, Tim (April 12, 2017). "Giannis Antetokounmpo became the 1st player to finish in the top-20 in all major stats". SBNation.com. Retrieved April 12, 2017. ↑ "Russell Westbrook, James Harden, LeBron James lead 2016-17 All-NBA first team". NBA.com. May 18, 2017. Retrieved June 16, 2017. ↑ "GIANNIS ANTETOKOUNMPO NAMED NBA'S MOST IMPROVED PLAYER". NBA.com. June 26, 2017. Retrieved June 27, 2017. ↑ "Antetokounmpo scores 28 points, Bucks beat Raptors 97-83". ESPN.com. April 15, 2017. Retrieved April 15, 2017. ↑ "Powell scores 25 as Raptors beat Bucks 118-93 in Game 5". ESPN.com. April 24, 2017. Retrieved April 25, 2017. ↑ "Whew! Raptors blow 25-point lead, but beat Bucks 92-89". ESPN.com. April 27, 2017. Retrieved April 27, 2017. ↑ "Greek Freak (37 points) leads Bucks past Celtics, 108-100". ESPN.com. October 18, 2017. Retrieved October 18, 2017. 1 2 "Antetokounmpo scores career-high 44, Bucks edge Blazers". ESPN.com. October 21, 2017. Retrieved October 21, 2017. ↑ "GIANNIS ANTETOKOUNMPO NAMED EASTERN CONFERENCE PLAYER OF THE WEEK". NBA.com. October 23, 2017. Retrieved October 23, 2017. ↑ "Antetokounmpo powers Bucks past Hornets 103-94". ESPN.com. October 23, 2017. Retrieved October 23, 2017. ↑ "Antetokounmpo scores 33 as Bucks breeze past Hawks". ESPN.com. October 29, 2017. Retrieved October 29, 2017. ↑ Levinson, Josh (November 19, 2017). "Giannis Antetokounmpo pulls down career-high 17 rebounds for Bucks on Saturday". numberfire.com. Retrieved November 19, 2017. ↑ "Irving' 32 helps Celtics hold off Greek Freak, Bucks 111-100". ESPN.com. December 4, 2017. Retrieved December 4, 2017. ↑ "Giannis, Bledsoe help Bucks rally past Wizards, 110-103". ESPN.com. January 6, 2018. Retrieved January 6, 2018. ↑ "Antetokounmpo takes over again as Bucks beat Wizards 104-95". ESPN.com. January 15, 2018. Retrieved January 15, 2018. ↑ Manrique, Bruno (January 15, 2018). "Bucks news: Giannis Antetokounmpo records first 20/20 game of his career". clutchpoints.com. Retrieved April 25, 2018. ↑ "GIANNIS ANTETOKOUNMPO NAMED A STARTER FOR THE 2018 ALL-STAR GAME". NBA.com. January 18, 2018. Retrieved January 18, 2018. ↑ "Antetokounmpo scores 41 points, Bucks beat Nets 116-91". ESPN.com. January 26, 2018. Retrieved January 26, 2018. ↑ "Nuggets make 24 3-pointers, beat Bucks 134-123". ESPN.com. February 15, 2018. Retrieved February 15, 2018. ↑ "Celtics survive wild finish, hold off Bucks 113-107 in OT". ESPN.com. April 15, 2018. Retrieved April 15, 2018. ↑ "Giannis, Bucks beat Celtics 97-86 to force Game 7". ESPN.com. April 26, 2018. Retrieved April 26, 2018. ↑ "Celtics beat Bucks 112-96 in Game 7, advance to play 76ers". ESPN.com. April 28, 2018. Retrieved April 28, 2018. ↑ "Antetokounmpo's triple-double leads Bucks past 76ers 123-108". ESPN.com. October 24, 2018. Retrieved October 24, 2018. ↑ Siddiqi, DJ (October 24, 2018). "Bucks' Giannis Antetokounmpo posts historic stat line in win over Sixers". cbssports.com. Retrieved October 24, 2018. ↑ "Giannis Antetokounmpo Named Eastern Conference Player of the Week". NBA.com. October 29, 2018. Retrieved November 25, 2018. ↑ "Antetokounmpo gets a triple-double as Bucks rout Kings". ESPN.com. November 4, 2018. Retrieved November 4, 2018. 1 2 3 "Giannis Antetokounmpo Named Eastern Conference Player of the Week". NBA.com. November 26, 2018. Retrieved November 29, 2018. ↑ "Crawford's last-second shot lifts Suns past Bucks, 116-114". ESPN.com. November 23, 2018. Retrieved November 24, 2018. ↑ "Giannis Antetokounmpo Named Eastern Conference Player of the Month". NBA.com. December 3, 2018. Retrieved December 4, 2018. ↑ "Antetokounmpo matches career high with 44, Bucks beat Cavs". ESPN.com. December 14, 2018. Retrieved December 14, 2018. ↑ "Giannis Antetokounmpo Named Eastern Conference Player of the Week". NBA.com. December 24, 2018. Retrieved December 26, 2018. ↑ "Giannis' triple-double helps Bucks turn away Nets 129-115". ESPN.com. December 29, 2018. Retrieved December 30, 2018. ↑ "Giannis Antetokounmpo Wins Second Straight KIA NBA Eastern Conference Player of the Month Award". NBA.com. January 3, 2019. Retrieved February 5, 2019. ↑ "Leonard, Siakam each score 30 points, Raptors beat Bucks". ESPN.com. January 5, 2019. Retrieved January 6, 2019. ↑ "Antetokounmpo scores 27 to lead Bucks over Rockets 116-109". ESPN.com. January 9, 2019. Retrieved January 9, 2019. ↑ "Antetokounmpo has triple-double as Bucks crush Heat 124-86". ESPN.com. January 15, 2019. Retrieved January 16, 2019. ↑ "Giannis Antetokounmpo Named Eastern Conference Player of the Week". NBA.com. February 4, 2019. Retrieved February 5, 2019. ↑ "Russell scores 27, Nets hit 19 3s and beat Nuggets 135-130". ESPN.com. February 6, 2019. Retrieved February 7, 2019. ↑ "Antetokounmpo fuels Bucks late rally to charge past Pacers". ESPN.com. February 13, 2019. Retrieved February 14, 2019. ↑ "2014 FIBA Basketball World Cup – Giannis Antetokounmpo". FIBA.com. Retrieved April 4, 2016. ↑ "Greece Win Acropolis Tournament". eurobasket2015.org. August 30, 2015. Retrieved December 31, 2015. ↑ "Giannis Antetokounmpo". eurobasket2015.org. Retrieved April 4, 2016. ↑ 2016 FIBA Olympic Qualifying Tournament Greece 34 - Giannis Antetokounmpo. ↑ Game: GREECE vs CROATIA (Group 7) Date: 8 July 2016. ↑ Giannis ANTETOKOUNMPO (GRE) SENIOR LEVEL. ↑ ΑΝΤΕΤΟΚΟΥΝΜΠΟ ΓΙΑΝΝΗΣ Κάντε κλικ επάνω στο όνομα της κατηγορίας για να δείτε τη λίστα των αγώνων του σε αυτή. Κατηγορία Συμμ. Πόντοι ΜΟ/αγώνα ΑΝΔΡΩΝ 38 372 9.79 (in Greek). ↑ "Έλληνες πολίτες οι αδερφοί Αντετοκούμπο". Sport24.gr. May 9, 2013. Retrieved December 31, 2015. ↑ @DimitropulosOCT (May 9, 2013). "Giannis Antetokounmpo received today his Greek citizenship. As of today, this shall be the official name/surname as it appears in ID/Passport" (Tweet) – via Twitter. ↑ Wojnarowski, Adrian (March 18, 2014). "From street vendor to surging NBA player, Greek Freak living the American dream". Yahoo.com. Retrieved April 4, 2016. ↑ Chouinard, KL (January 2, 2014). "Giannis Antetokounmpo's other name". Bucksketball.com. Retrieved April 9, 2016. ↑ Helin, Kurt (October 23, 2013). "Greece wanted nothing to do with his family until NBA noticed Antetokounmpo's basketball skills". NBCSports.com. Retrieved April 4, 2016. ↑ Gruman, Andrew (February 3, 2014). "Family matters: Bucks rookie Antetokounmpo reunited with family". FoxSports.com. Retrieved December 31, 2015. ↑ "Antetokounmpo brothers to begin 3-month military service". naftemporiki. July 12, 2016. Retrieved July 12, 2016. ↑ Steinberg, Russell (June 27, 2014). "2014 NBA Draft Results: Knicks select Thanasis Antetokounmpo with 51st pick". SBNation.com. Retrieved December 31, 2015. ↑ Dayton’s Kostas Antetokounmpo ruled ineligible for 2016-17. ↑ Deveney, Sean (February 27, 2014). "The Baseline: Greek Freaks everywhere! Prepare for the NBA's Antetokounmpo-ization". SportingNews.com. Retrieved December 31, 2015.